Over 150 hundred guests gathered at the Japanese Embassy last week to enjoy an evening of event celebrating Japanese rugby, culture, tourism, food and drinks. With the Rugby World Cup (RWC) in Japan next year looming ever closer, Japan National Tourism Organisation (JNTO) held two events last week to promote tourism and travel to Japan. An evening mixer event for UK media and travel agencies at the Embassy of Japan was swiftly followed by a daytime event for the general public at the National Museum Cardiff, timed to coincide with the opening day of the museum’s new Japan-related exhibition, Kizuna. 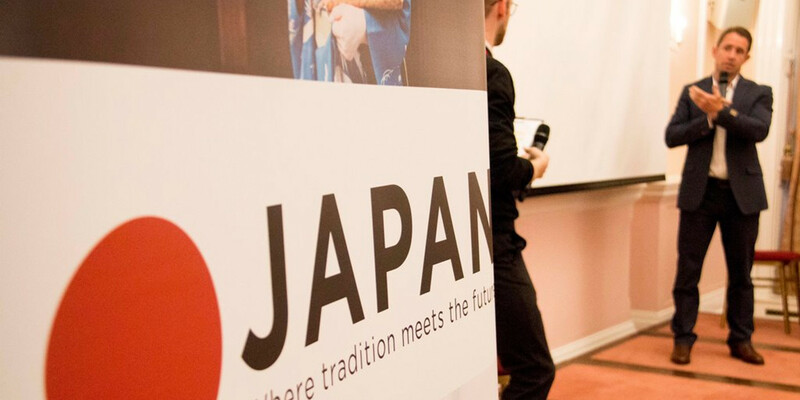 With guests from all across Japan – from Hokkaido in the north to Okinawa in the south – and featuring a Q&A session with special guest Shane Williams, MBE, JNTO hosted Visit Japan RWC2019 Evening Event at the Embassy of Japan. Over 150 guests were welcomed to the evening event, including travel industry and media representatives from companies and organisations including BBC, Rough Guide, Telegraph Sports, Culture Trip, England Rugby Travel, Sports Travel & Hospitality, Inside Japan Tours, Jaltour, Japan Travel Centre, JTB Europe, and many more. After welcome speeches by Mr. Koji Tsuruoka, the Ambassador of Japan to the UK, and Mr. Hironobu Nara, Director of JNTO London Office, the guests enjoyed a presentation by Ms. Polly Stannard, Marketing & Communications Assistant Manager, JNTO London Office, who introduced the RWC match venues and host and training camp cities where the home nations of England, Scotland, Wales and Ireland will stay during the RWC. Ms. Stannard introduced each of the venues in turn, covering its location in Japan, the dates of the home nations’ RWC matches, and recommended activities, food and sightseeing spots. Guests then enjoyed a video and Q&A session with the event’s special guest, Mr. Shane Williams, MBE, former Welsh rugby union player and International Player of the year 2008. After a showing of the trailer for Big in Japan, a mini series commissioned by JNTO, guests were treated to a Q&A session with Shane chaired by Mr. Matthew Joslin, Marketing & Communications Manager, JNTO London Office. In his answers, Shane shared his thoughts about challenges he faced while playing in Japan, Japanese culture and cultural differences, and his bucket list recommendations for visitors during the RWC, including pub culture and nightlife. The presentation part of the evening was brought to a close with a further welcome speech and toast by Mr. Martin Barrow, Visit Japan Ambassador. Watch the teaser trailer for Big in Japan that was screened at the event here. The medley of presentations was followed by time for networking and visiting the stands of JNTO and Japanese local governments and tourism boards dotted around the room: Sapporo, Tokyo, Yokohama, Shizuoka, Matsumoto, Toyota, Aichi, Kansai, Kobe, Wakayama, Kyushu, Oita, Kumamoto, Okinawa, and Nikko and Tobu Railways. Guests were able to sample regional varieties of sake (Japanese rice wine), sweets and chocolates from many of the areas as they worked their way around the stands. Guests who received stamps from at least three stands onto a specially provided lucky draw card were also able to enter a lucky draw to win a series of fantastic Japan-related prizes, including a rugby ball signed by Shane Williams and tickets to England RWC matches. Canapes including sushi and yakitori from Miyama and sake from Sake Samurai were served throughout. The evening concluded with the eagerly-awaited results of the lucky draw. Ms. Rie Yoshitake, UK representative of Japan Sake & Shochu Makers Association, awarded bottles of the finest Japanese sake to seven lucky winners. Ms. Yuka Sano of Cross Media awarded a pair of tickets to Hyper Japan to one lucky winner. Mr. Itakura, Deputy Director, Tokyu Hotels Co., Ltd., awarded a pair of vouchers for four nights’ stay at Tokyu Hotels to one lucky winner.Finally, Mr. Hironobu Nara, Director of JNTO London Office, awarded a RWC 2019 Official Rugby Ball autographed by Shane Williams to one lucky winner, followed by the grand prizes, three pairs of tickets to England’s RWC matches against Tonga in Sapporo, USA in Kobe, and France in Yokohama. The much-anticipated draw saw a total of thirteen delighted prize winners leaving the stage clutching their cherished prizes in their hands. Tourism to Japan is growing rapidly in recent years as the country sheds its reputation for being too remote, expensive or difficult to visit. In 2013, the Japanese government set the ambitious target of achieving 20 million visitors to Japan by 2020. However, this target was smashed five years early in 2016, prompting it to announce a fresh target of 40 million visitors by 2020, the year of the Tokyo Olympic and Paralympic Games. Visitor numbers from almost all international markets continue to increase steadily, with inbound figures surpassing 28 million people by the end of 2017. Such numbers suggest that the strong growth of Japan’s inbound tourism market is set to continue, especially with two high-profile international sporting events hovering on the not-too-distant horizon in the next couple of years. Japan will host the Rugby World Cup in autumn 2019, with matches taking place at twelve venues up and down the country, from Sapporo in the north to Kyushu in the south, while the capital city Tokyo will host the Olympic and Paralympic Games the following year in 2020. With excitement building around the hosting of these prominent sporting events, all eyes will continue to be on Japan over the next few years. Watch this space for more exciting news and updates to come! Find out more about the RWC 2019 here. Find out more about tourist activities and sightseeing spots in and around the RWC host cities here. To stay up to date with all the latest happenings in Japan follow us on Facebook or Twitter.